Matsumoto Castle, known as 松本城 (Matsumoto-jō) in Japan, is located in the city of Matsumoto, which is in the Nagano prefecture. 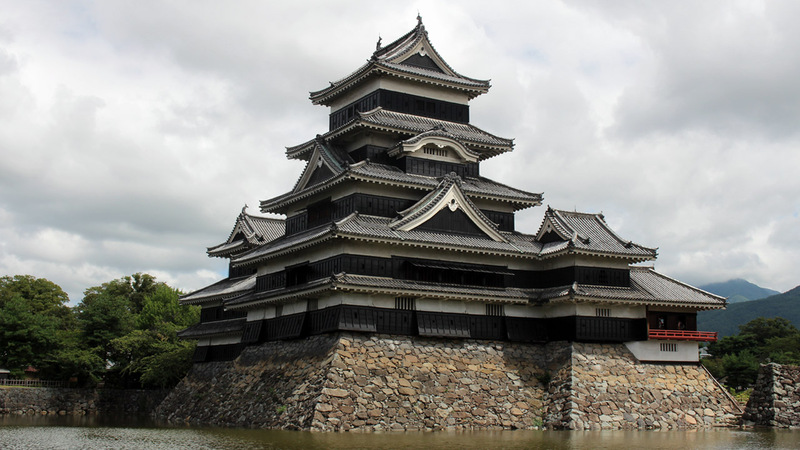 Construction began in 1592, making it the oldest still standing castle donjon in Japan. It is one of only 5 castles in Japan which house “Natural Treasures”. I visited the castle on August 23rd [just shortly after the AFS Orientation Camp]with my hostfamily. Matsumoto-jō is easily accessible by foot from the train station, taking around 10 to 15 minutes. The Town Sneaker Bus departs from the train station every 30 minutes and takes you directly to the castle, as well as to other sightseeing spots. As seen in the image above it is clearly marked, and there are many other signs pointing towards it so you won’t get lost. On the way to the castle from the train station you will find a bookstore shaped like Matsumoto-jō, which is not only a good indicator that you are going in the right direction, but also a very pretty building in and of itself. The Castle is open from 8:30am to 5pm every day. I would strongly recommend not going on days Friday through Sunday, as the castle is very full on these days and it is difficult enough to navigate the very narrow stairs inside of the castle without having a lot of people trying to do the same. Visiting the area outside of the moat is admission free, however entering the castle requires paying an admission fee being ¥610 for adults and ¥300 for children. The most notable feature of Matsumoto-jō is its donjon, which has been preserved from the 16th century. One enters the castle through the smaller keep northwest of the main donjon, which looks like it has 3 stories from the outside, but in fact hides a 4th story for defense. As is usual in Japan you have to take off your shoes at the entrance of the exams, plastic bags are provided to carry them around inside of the castle, so make sure you wear shoes that you can easily slip on and off again. The second floor of the donjon houses a weapons museum, showing various guns and swords which were all donated from the private collections of Akahane Michishige, who built said collection with his wife Kayoko. The top floor offers a breathtaking view of the city from all four sides, each offering something different.